I found a set of Valentine's window clings at the dollar store and decided to put them on the light table for the boys to check out. What I did not anticipate was that they would enjoy playing with the window clings as much as they did. 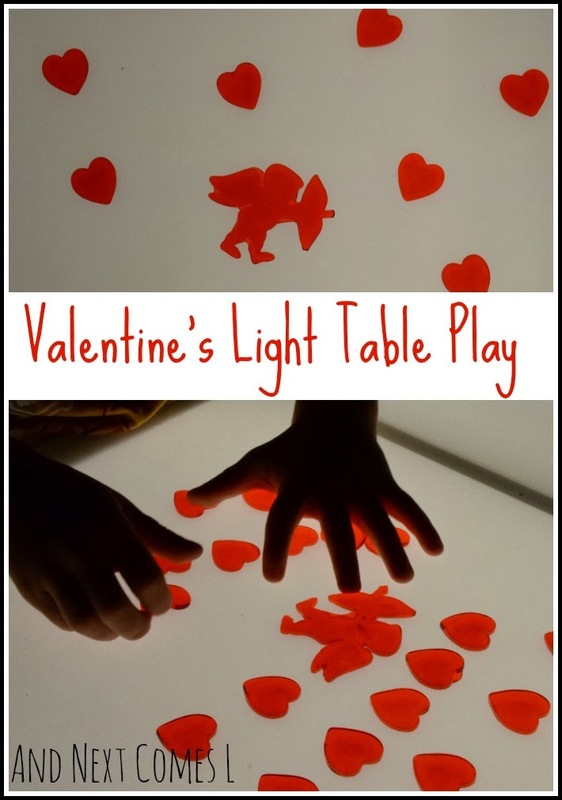 They seriously could not get enough of the "sticky hearts," as J liked to call them, in this simple Valentine's Day light table activity for kids. The set of window clings came with a bunch of hearts and two cupids so I split it up and set out two stations on the light table, one for each boy. At first, J was uninterested. K, on the other hand, tried picking up one of the hearts and started giggling when he realized they were sticky. Of course, then J had to check out what was so funny. One of the first things that J did was line up the hearts and started counting them. He then stacked them into a tower and watched as they came crashing down. J was ready to stop playing with the window clings at this point, so I presented another way for them to play with the hearts. We have mirrors hanging above our light table so I stuck one of the hearts onto the mirror. Well, that apparently was the coolest thing I've ever done because it simply captivated the boys. Then K began to wonder what other surfaces the hearts might stick to. Perhaps my forehead? Ha! Thank goodness for the mirrors above our light table, which allowed me to capture this hilarious little moment. The boys grabbed some other Valentine's items to further their play with the window clings. K wanted to check out the Valentine's heart containers that we also used for this sound matching activity and spent some time opening and closing the heart containers. After K opened all of the containers, J started to place one sticky heart into each container. I never imagined that some simple window clings would turn into some one-to-one correspondence practice. While J was busy with the sticky hearts and heart containers, K grabbed two large heart bowls and started doing some "cooking." He is absolutely obsessed with cooking everything and anything lately, which is so stinking cute. Here is K transferring hearts from one bowl to another. You've never looked better, Dyan! So cute! Hahaha!! Why thank you, Devany!